Tired of spam, robocalls or vendors calling your phone number? You can easily block specific phone numbers from calling or texting your CallAction number with the simple click of a button. Below we will show you three different ways to block callers. Done, now the blocked phone number can no longer call or text. If they do so, they system will simply hang up and text messages will no longer be received. Accessing your "Contacts" you'll now see a small icon in the front of the phone number to indicate a caller has been blocked. You may block callers directly on your mobile device also. Please click on the gears icon and you will now see the ability to block a caller. If you blocked a caller by accident, you may simply repeat the steps above and click "Blocked" button to automatically unblock the phone number. You may view a list of phone numbers that you have you blocked using the following steps. 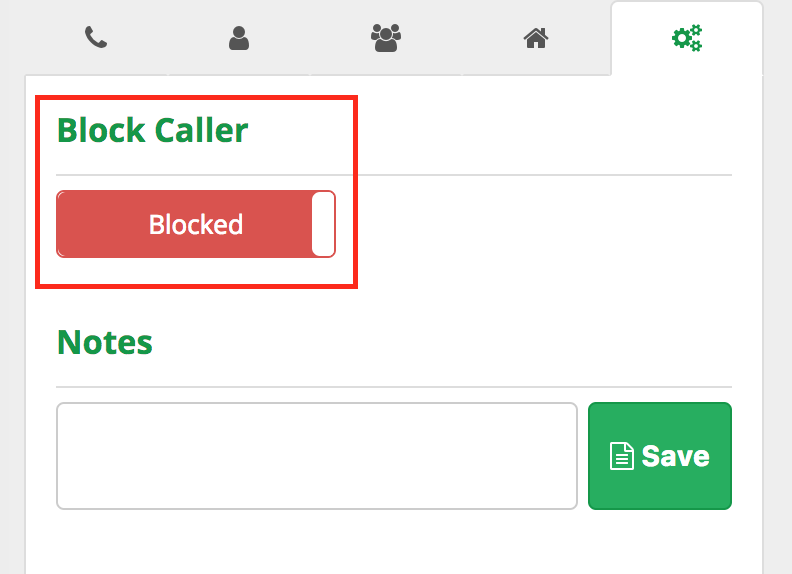 You can view a list of blocked callers by date blocked and the blocked number. Click "details" button to view specific contact and to unblock the caller. Not Using a CallAction a Phone Number? If you are an iPhone user, you can also block a phone number. Tap the information icon to the right of the number you wish to block. Tap the blue Block this Caller option, followed by Block Contact to confirm the request. That's it, you have now blocked a caller in your iPhone. Just make sure you have not blocked your actual CallAction phone number. If you are an Android user, you can try these instructions to block phone calls. Choose to Add to reject list. You are done, you have now block callers on your Andriod phone. Search our online help or use the chat at the bottom right. You may also call our office Mon. - Fri. at (855) 713-2255.